No matter what field you’re in no matter what you’re trying to learn from Physics to law to anatomy. What matters most when studying is sticking to a routine. A daily routine at best. I’ve already written at length about the books and tools to get you started to learn Japanese. But if you mastered the basics there was no really comfortable way to learn new vocabulary. And you really need to learn a lot of vocabulary when you want to be able to read Japanese. I used Anki for quite a while and just wrote down all the unknown words I encountered when reading some manga or stuff in general. Not a bad way to get introduced to new words but a stressful one. 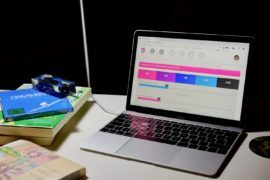 After all, writing everything down in Anki takes time and if you want to do it the right way you should actually write down the whole sentence the unknown word appears in. And that’s where iknow.jp comes into play. Formerly known for its once free Japanese core sentences you learn all Japanese by (you guessed it) sentences. Always coupled with a fitting picture to give you an image to think about as well. Everything is fully voiced, did I mention that? And after using Japanesepod101 for quite a while I really noticed how important it is to train your listening comprehension as early as possible. 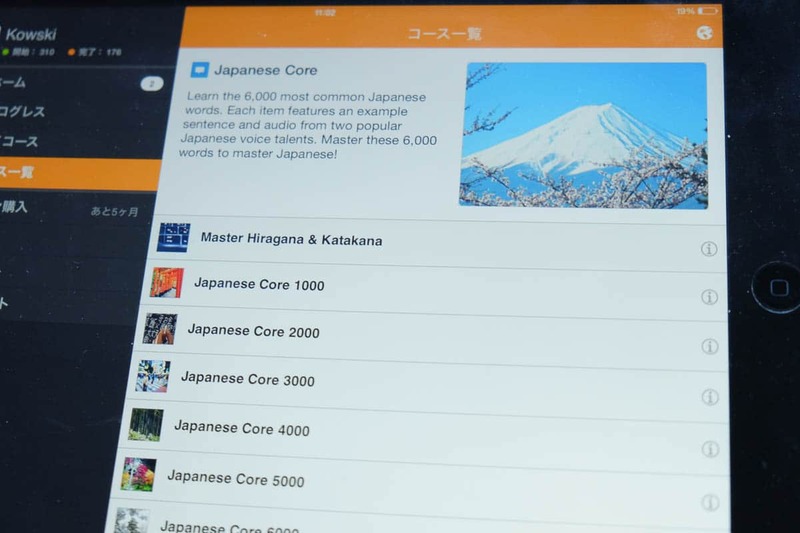 When I wrote about Kanji Box being a neat app to practice your grammar skills a reader recommended iknow.jp to me. I had a quick look at their site and just did their placing test to see how things are going and where I would be able to start. Nice feature, that you don’t have to start again with the very beginnings. Sometimes it’s not a bad way to start again, to repeat the basics but on the other hand, nobody wants to go through all the more common words again and again if you already know them by heart. Not having the feeling of making any real progress for yourself can be frustrating and that’s exactly what we don’t want to happen. To feel frustrated or annoyed by learning Japanese. After all, we’re in it for the long run. The power of learning words in the context of a sentence. Each language is a little different in the way you express certain things or react to different situations. This has a lot to do with different cultural backgrounds, different politeness levels and overall how various events are treated differently by different cultures. Apart from that, there are just some languages who don’t have several words to express nuances in an action. German (my mother tongue) for example has a highly complex grammar but only a pretty small amount of vocabulary in comparison to English or, in our case here, Japanese. So when learning a new word it’s difficult to put it into place in your mind and really understand the meaning of it when not seen in context. That’s where iknow really shines. Helping you to give a newly learned word some real meaning inside your brain. Nothing better than to couple learning new vocab with a corresponding sentence. The sentence is spoken out loud by a native, plus a picture to look at which sums up the action. Neuroanatomy and the ways the brain really works are still pretty much unknown to humankind. There are a lot of theories. Some are even proven up to a certain point but we’re still miles away from really comprehending the abstract ways our brain is working in. There are probably some of you how could explain this a lot better than me but I’ll still try to give you a very basic idea of how our brain is working. I think this helps immensely to understand why certain approaches are just so much more effective. There are different areas in our brain-cortex which control different aspects of our behavior and actions. The main idea behind trying to stimulate our learning process by triggering as many different “senses” as possible is to activate as many different cortex areas (outside areas of our brain) as possible. For example one is processing visual stimuli one is responsible for auditory stimuli and so on. Around 1940 a guy named Papez discovered that certain parts of our brain or better certain small structures who are connected and build a circle (where information is processing through again and again) are responsible for the control of emotional expression. I wrote this like it’s a fact but these are all just theories. Another guy came along and defined the Papez neuron circle and called it the limbic system and said that the frontal part of your brain is responsible for processing all these kind of information which got an emotional connection. But now comes the fun part: Today’s science is thinking that the so-called “limbic system” is not only responsible for controlling and processing emotions but also an integral part of our memory. Or better how memory develops. To cut things short. Even if these are more or fewer theories (of which some points have been proven to a certain degree) we know that the part of our brain that is responsible for creating memories is also responsible for controlling emotions. And that’s why it is much easier to learn something when you can get an emotional connection to it. Or rather to a memory. And that’s why iknow is so effective because they do exactly that. Each sentence tells a little story. There are 6000 sentences in total graded after common usage. So the first 1000 are for the beginners and while progressing the material gets more advanced. Sound reasonable, right. The vocabulary used in each pack (which consists of 100 new words) is used to construct the sentences. Which means that a learned word will appear in a sentence where you’ll learn another one. Pretty clever. The great part is that every sentence tells a small story and with the way the speakers recorded it and the corresponding picture you can feel a certain emotional tone which each one. At least I do. And because of this, we’re much more likely to remember the taught vocab. They really encourage you to stick to it. I’m a sucker for statistics and that’s why iknow is so motivating for. You set yourself a study goal for the time you want to study each week. I put down a reasonable 90 minutes because nothing is more frustrating than setting your goals too high. Each day you study will be marked in a virtual calendar and of course, you want every single day to have that mark. Along with that, you can see exactly how much time you spent with each course and a total as well. Isn’t this great to know that you learned 300 new words in maybe 10 hours. But again, I love statistics. Completely forgot that the consecutive days of studying are counted. I set myself the goal to study every single day even if it’s just a burst of 10 words until I visit Japan again in August. All these features make it ridiculously easy to stick to a daily routine. The pricing, the incredible App, and the coupon. 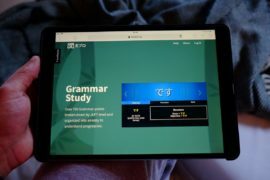 I’m a huge fan of my iPad and am doing the big part of my Japanese studying with Apps. And this is where iknow really shines, their iOS Apps. They are intuitive well working and looking plain gorgeous. A friend of mine Sebastian even met the guys at a developer conference in Tokyo and had to say a lot of positive things about them. But when you’re using the App don’t purchase your subscription (if you’re interested) with it. It’s more expensive (through Apple’s fees) than just registering online. I even got in touch with the iknow team and got you a 1-month free coupon. Just register for a free account and redeem it afterward. Update: The coupon expired and the folks over at iKnow didn’t want to extend its validity. If you should think about making a 12-month subscription use this link and we both get 3 additional months for free! 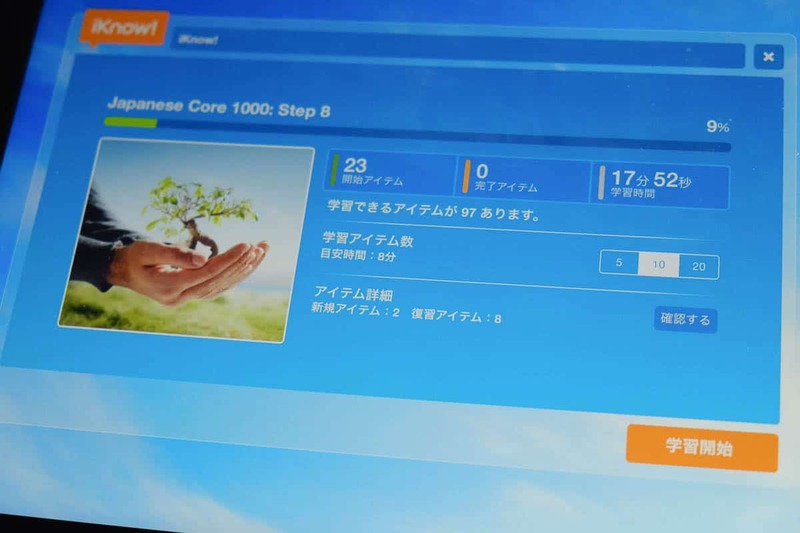 I highly recommend using Japanesepod101 in conjunction with iKnow. Together they make the perfect team for learning Japanese. 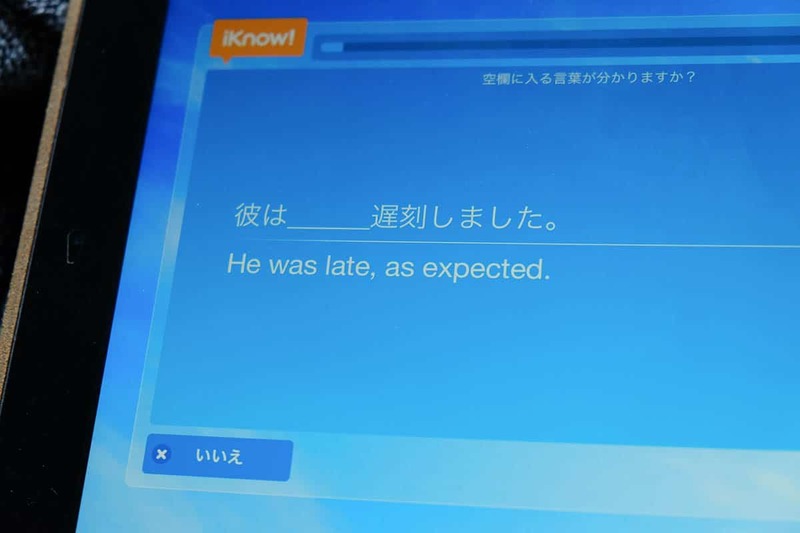 This way you get in some essential vocabulary and sentences with iKnow and some proper listening comprehension and grammatical explanations with Japanesepod101. Coupled with a solid textbook (like Genki) it’s probably the most efficient way to start learning Japanese. Let me know what you think about the iknow App. I’m sure some of you are using it already. I think the pricing is pretty fair and it’s currently the main tool I use for my Japanese studies. Actually, I even quit WaniKani because I just couldn’t manage to do both iknow and WK at the same time. Looking forward to your feedback.